Cartilage piercing jewellery is specifically designed for cartilage piercings. A cartilage piercing is located on the ear, such as the tragus piercing, auricle piercing, rook piercing, helix piercing, snug piercing or pinna piercing. Cartilage piercing jewellery comes in a fabulous variety of funky designs, with unique charms and patterns to choose from to keep your cartilage piercing in style! 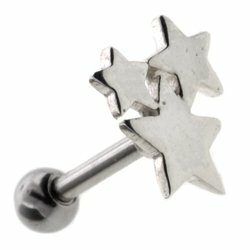 This stunning range of cartilage piercing jewellery includes a very unique choice of cartilage piercing studs, with one removable threaded ball or accessory that screws onto the main barbell stem. 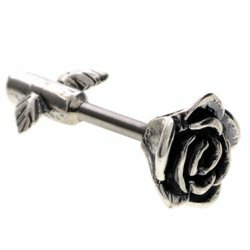 Cartilage piercing jewellery includes many different designs from roses, jewels and delicate, glamorous cartilage charms to the more classic hearts and stars. These gorgeous cartilage piercingÂ shields and cuffs are very unique and lookÂ fabulous for all occasions! Treat your cartilage piercing to a refreshing new style,Â with many different designs to choose from you’ll be spoilt forÂ choice. This cartilage piercing jewellery features a selection of cuffs and hanging charms that drop down from your cartilage piercing. TheseÂ jazzy cartilage tragus studs are designed to sit through the tragus cartilage piercing. Add a touch of sparkle with the jewelled tragus studs or some funky style with the hearts, stars, screws,Â padlock and feather! 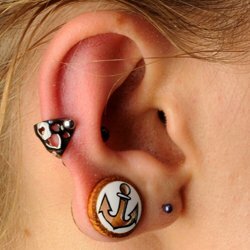 This entry was posted in Ear Piercings and tagged Cartilage Cuff, Cartilage Jewellery, Cartilage Piercing Jewellery, Cartilage Piercings, Ear Cuffs, Helix Piercing Jewellery, Tragus Piercing Jewellery, Tragus Studs on December 3, 2009 by Piercing Guru.